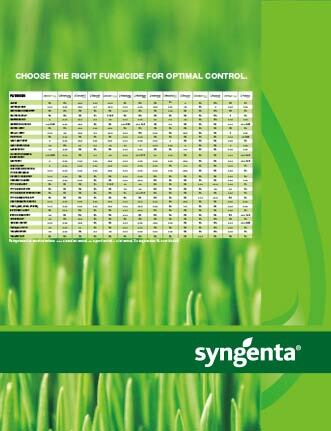 View the Labels/SDS information for Medallion SC Fungicide. 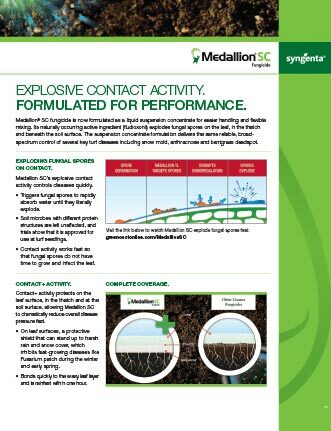 Medallion® SC fungicide is now formulated as a liquid suspension concentrate for easier handling and flexible mixing. Its naturally occurring active ingredient (fludioxonil) explodes fungal spores on the leaf, in the thatch and beneath the soil surface. The suspension concentrate formulation delivers the same reliable, broad-spectrum control of several key turf diseases including snow mold, anthracnose and bentgrass deadspot. Medallion SC targets pathogen spores quickly stopping germination. View this video to witness fast Medallion SC Bio-inspired explosive performance. Medallion®, Greencast® is a trademark of a Syngenta Group Company.